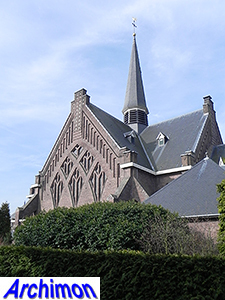 The old church of Hoeven was a cruciform, aisleless building with a nice Gothic choir and transept and a modest nave and a tower. 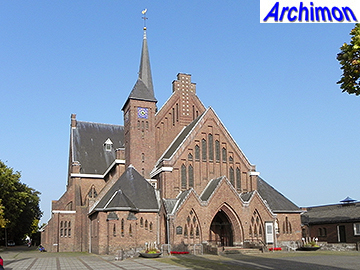 By the end of the 1920's it must have become too small, as the parish commissioned architect J.H. 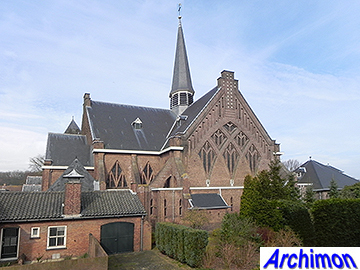 Berben in Breda to design a new church, to be built elsewhere in the village. 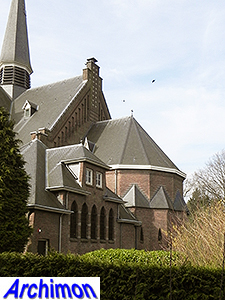 The old church was sold to the municipality and was neglected for years. In 1942 it was finally decided to restore it for future use as a town hall. Nothing came of these plans, probably because of the war, and in 1944 it was largely destroyed when German troops blew up the tower. Although the transept and choir could have been saved all remains of the church were demolished in the 1950's. 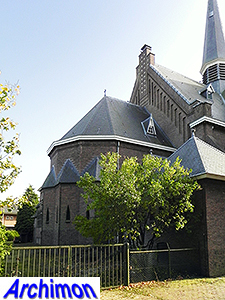 The new church had been built in 1928-1929. The architect J.H. 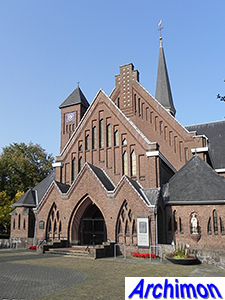 Berben was not a big name in church design, and his only previous involvement in church architecture was with the St. Theresia in Breda, a centralizing church by W. te Riele. 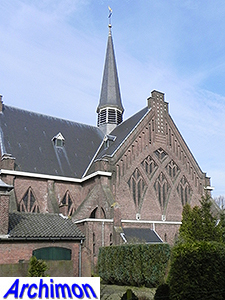 As Berben's contribution to this church was of a technical nature, the St. Johannes in Hoeven was probably his first complete church design. 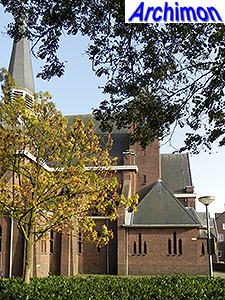 Like the St. Theresia, the St. Johannes is a centralizing church. It's a three-aisled cruciform building with narrow side-aisles, a big, almost square central space and a short, narrower nave. The undeep choir forms a unity with its pointed vaults, a feature only visible inside, and has radiating chapels. The central space is vaulted with a different material than brick, possibly concrete. At the front is a spacious portal, but although some sources claim that it was big enough to let cars drive through for the yearly car blessing held in Hoeven since 1927, this seems unlikely even for small cars. In reality, a big space in front of the church was kept free to accomodate the car blessing. A prospective sketch of the design, published in March 1928 before construction began, shows a few differences with the church as it was built. 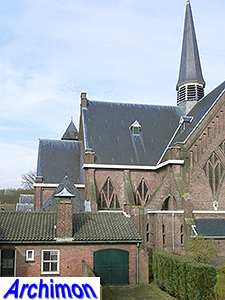 The biggest difference is the crossing tower; instead of the current steeple the sketch shows a majestic tall and wide octagonal crossing tower which would rise almost 25 meters above the church. 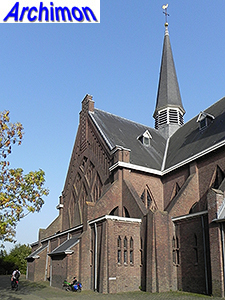 Also Berben probably changed his mind about the exact location and shape of the lower front tower; instead of the east side (the church is not oriented, its front facing the south) it was built at the west side, but while the sketch showed it with a polygonal upper part, it was built with a square cross-section for its entire height. 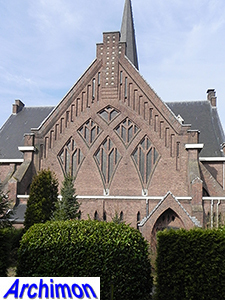 Despite these changes, concessions in some cases, this is a fairly extravagant example of a church in an Expressionist style. 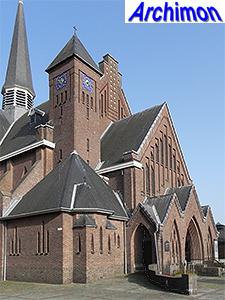 The church was designed in an Expressionist style with richly ornamented brickwork; large pointed windows, climbing niches and crosses at the gables of nave and transept. The pattern of the windows of the transept are especially interesting. 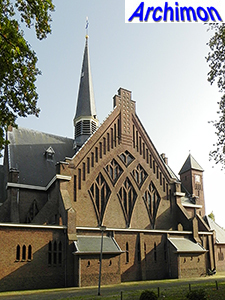 Berben designed one more church in a similar style, the slightly more modest Christus Koning in Breda (built 1931-1932, demolished 2003). 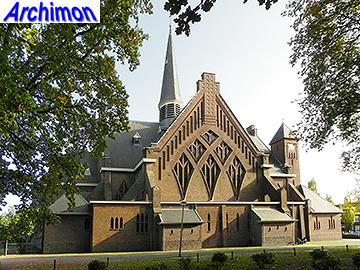 His next church, the St. Martinus in Rucphen (built 1932-1933), also shows Expressionist elements but these are quite moderate and combined with elements of Traditionalism. Berben died in 1941, only 58 years old, leaving a small body of religious works of which the St. Johannes is probably the highlight.